The Thai Community Development Center held a tree planting on Dec. 3 on Hollywood Boulevard in Thai Town to beautify the neighborhood and commemorate the late Thai King Bhumibol Adulyadej, who died in October. The planting was held in partnership with the Royal Thai Consulate General, the Thai Town Rotary Club and the Hollywood Beautification Team. Nineteen trees were planted on Hollywood Boulevard between Western and Normandie Avenues. 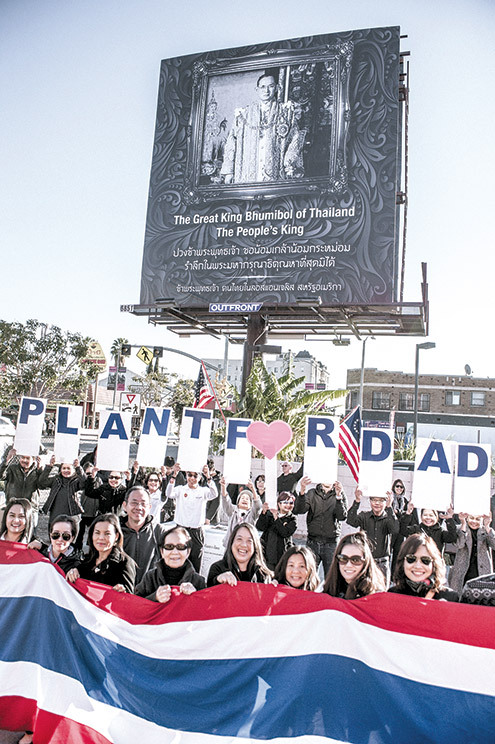 The Thai Community Development Center has planted 41 trees in the area since 2000, when it entered into a covenant agreement with the city to maintain the Hollywood Boulevard streetscape in Thai Town. Golden trumpet trees were planted because the late king was well known for his talent in playing wind instruments, and yellow is associated with the Chakri Dynasty. The planting coincided with events held throughout the country honoring the king, whose birthday was on Dec. 4. The Hollywood Beautification Team will maintain the trees. More than $15,100 in donations were collected to purchase the trees and pay for three years of maintenance.